A nice evening in here tonight at the Clubhouse, a light breeze from the west and some blue sky! We just concluded another trip here, and a very nice trip it was. 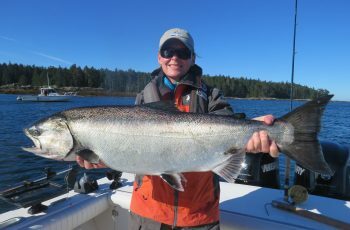 Some better sized chinook showed up and that made the lucky guides and anglers very happy. 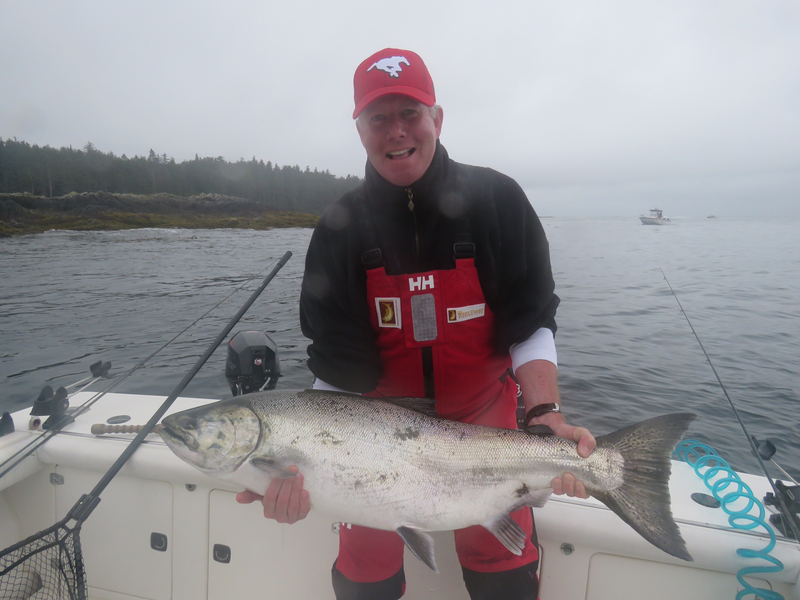 Below is a pic of a very nice tyee at 36 lbs Gary Hayden released during the previous trip. 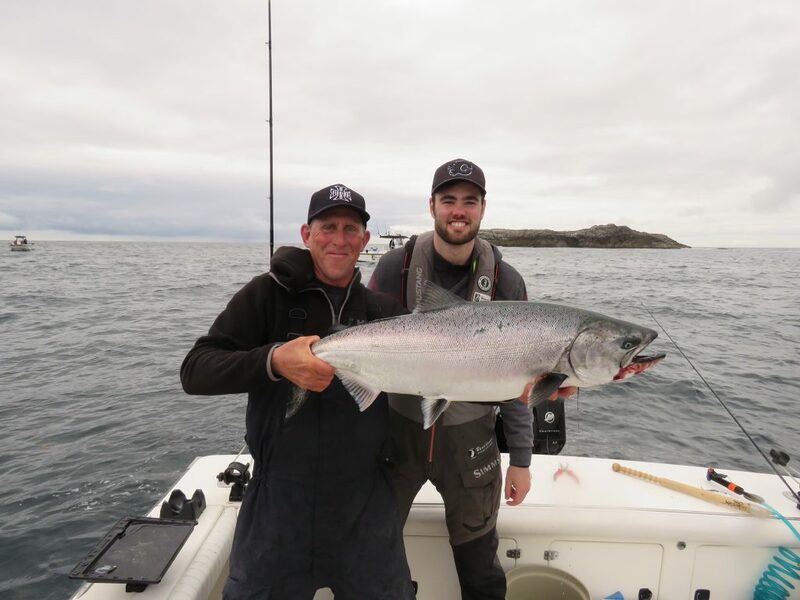 This fish was caught with the help of guide Korey, out at Gary’s favourite spot, Andrews. Gary told me there were small windows of 15 minutes at a time where the lions backed off and he could grab a decent chinook. 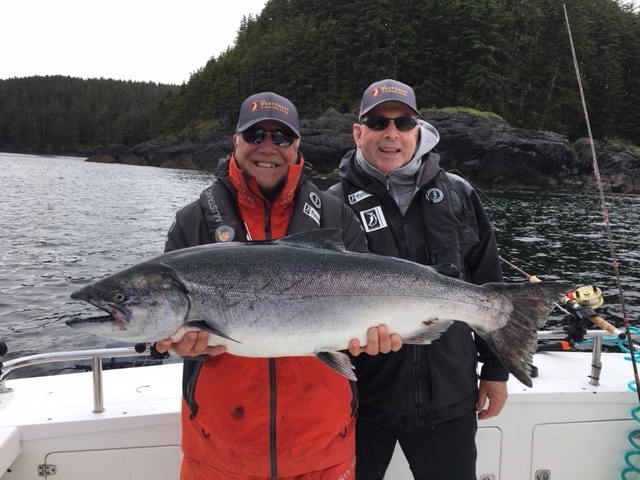 Gary and Korey had a great couple days in the little bay pulling in several decent chinook. Gary Hayden with guide Korey and his released 36 lber. Gary Hayden and a nice fish. I was fishing with Mike Throne and his son John. We did not get on em like usual and battled hard most of the trip for size and quantity. We did find this nice high twenties the last day of the trip out at the bowel, and that helped ease the anguish on our boat. We did play plenty smaller teener chinook of course in search of the monster. Mike Throne and myself, released high twenties. 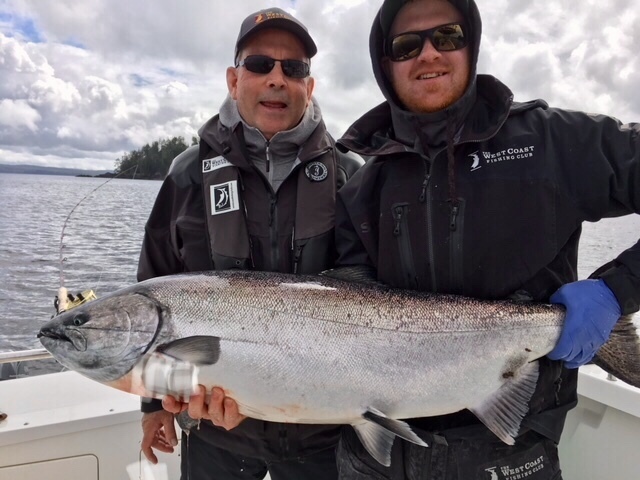 June 28th Reg Pattemore and son Liam arrived from Calgary and we pounded out to Lacey chasing a called bite. I blew it, screaming tide, rough, and yup, no fish. So I panicked and flew over to close by West Bank, dropped a tasty cut plug and soon after, Reg had a buckled rod, see pic below. 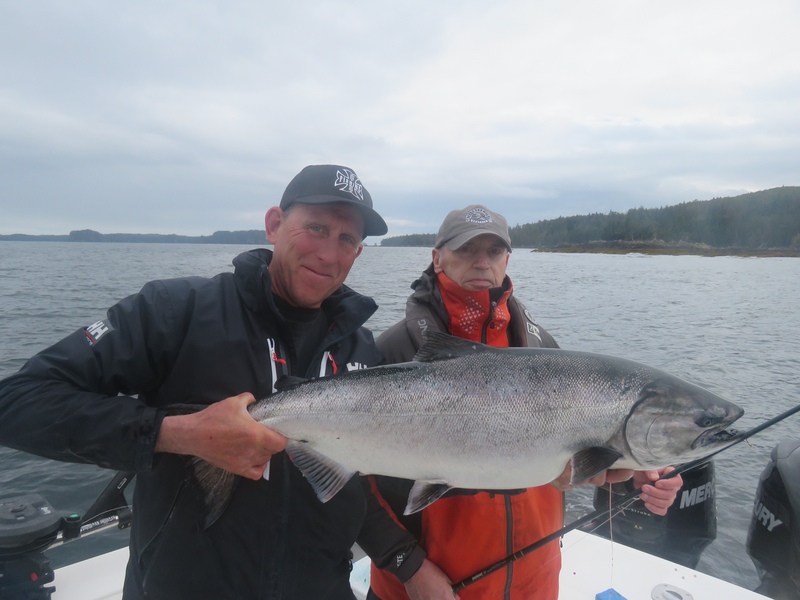 Reg Pattemore buckled on a 33 lb tyee. 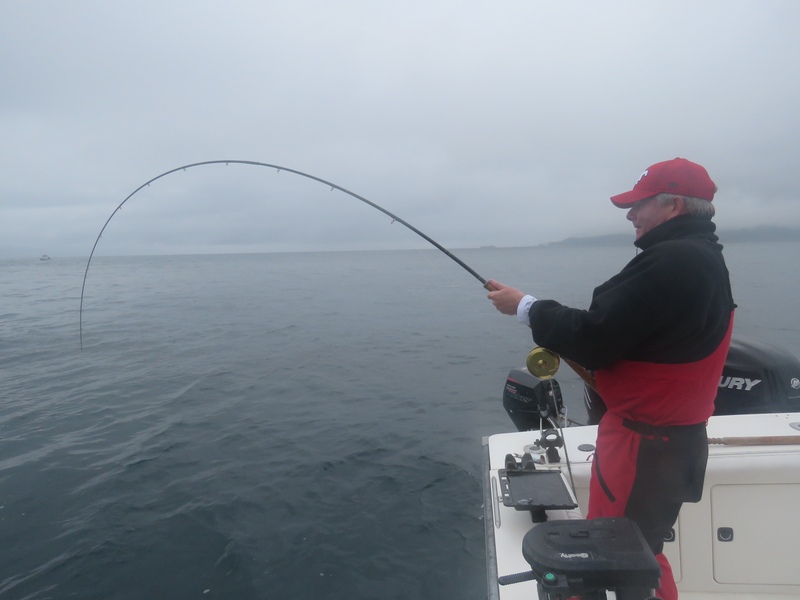 After a perfect angling job, Reg had a 33 lb tyee in the net in short order. We always release our tyees if possible, and this one was revived in my tub of cold pacific sea water, see pic below. 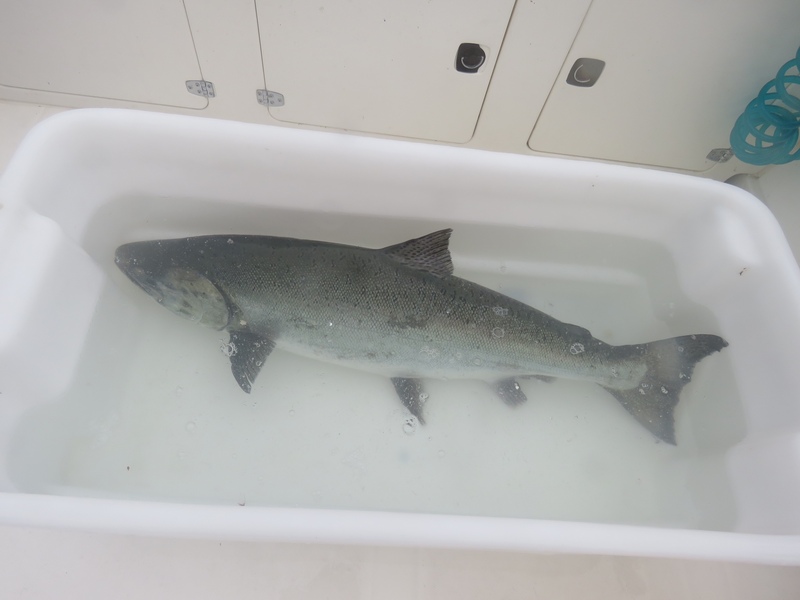 A happy tyee revived safely in cool pacific water about to be released. Shortly after a couple pics we taken and off she went, swimming off rapidly. Below are a couple pics of the fish, excuse the water on the lens, it was wet out there. 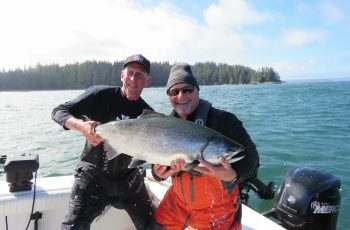 Reg and his tyee of 33 lbs released. June 29 was a big day in my skiff, as we worked out west for the day. 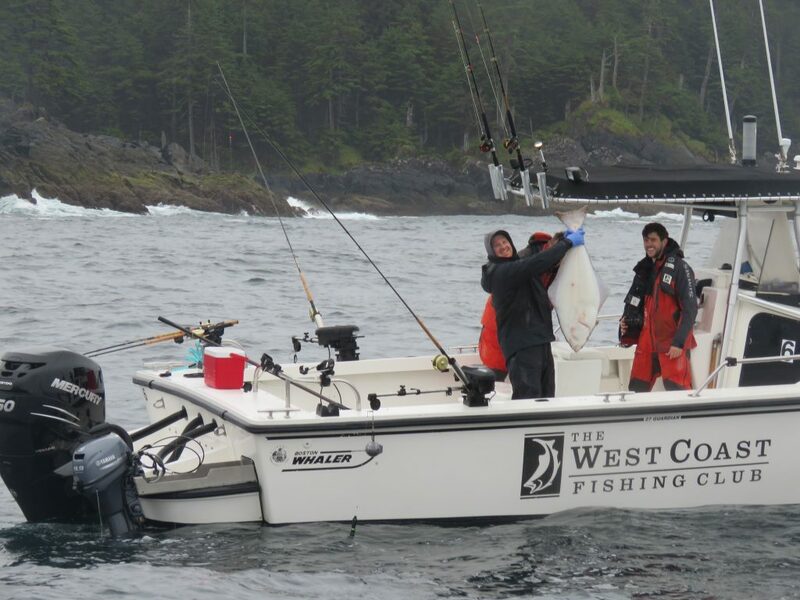 Although we went periods of time without bites, we were not looking for coho or other bycatch. We agreed we were fishing for big kings, all in. We did find seven nice fish in the low to high twenties, which for this year is big fishing. 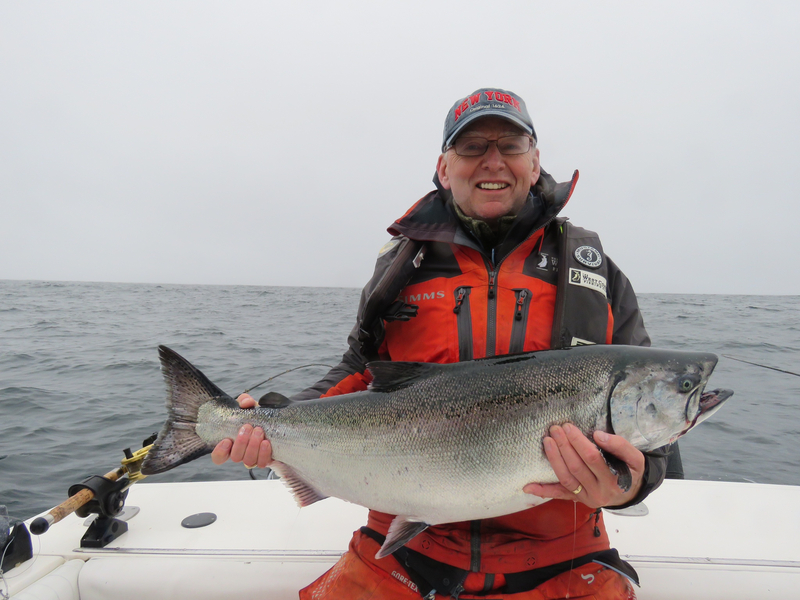 Below is a pic of Jim Freeman with his very nice retained chinook in the mid twenties. Shortly afterward while dragging deep Reg grabbed this high twenties which we retained. Below is a picture of a nice pair of kings! Jim Freeman and his very nice chinook. 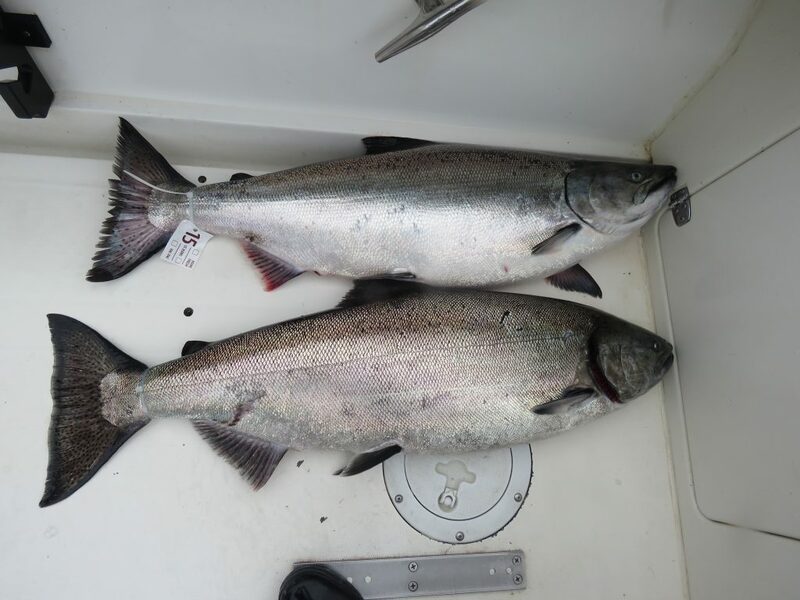 A lovely pair of large chinook we retained for Reg Pattemore and Jim Freeman. The afternoon the bite continued out west, below is a picture of myself and Liam with his mid-twenties chinook shortly before returning it to the ocean to continue on its way. Liam’s mid twenties chinook , a big day for us! We then hit a double of very nice low twenties, below is a picture of the father and son having a hoot out at Lacey! The Pattemore’s doubled up out at Lacey! Korey managed a very nice troll caught halibut of 30 lbs, before bombing out to the troller tac offshore and angling a mid twenties for his guest. Korey trolling strong chickens out west! Today things slowed off. Who knows why. Weather was fine. 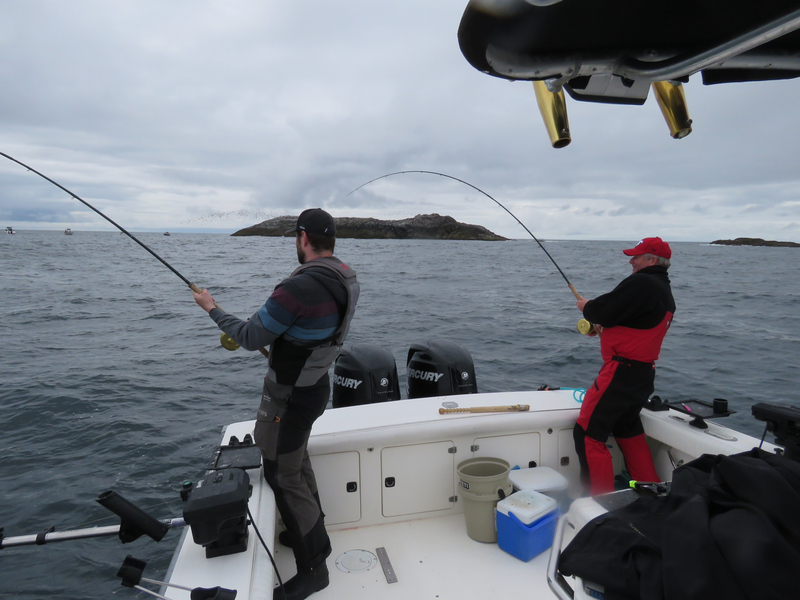 The boys fishing offshore Jalun had action, Bud’s skiff grabbed a 27 lb chinook with the Helmers. That was big fish of the day. We are still mostly fishing shallow depths, and searching for pockets of bait. Owen and Pete are targeting outside offshore waters such as the troller tack off Pillar and they are keeping busy. It all depends what you are looking for. 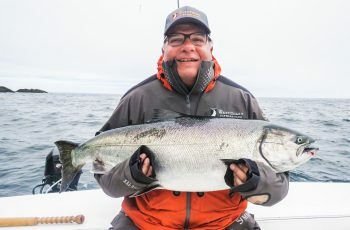 If you love the idea of sitting and waiting patiently for large chinook salmon, we are now in that window of opportunity. 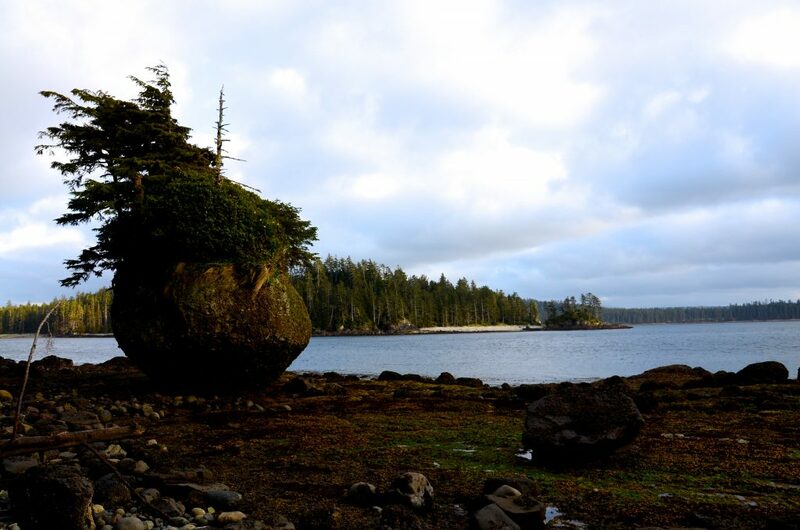 The big fish tend to follow shorelines, kelp beds and back eddies and this is exciting fishing. The smaller chinook tend to feed offshore and often are caught deep along the bottom contours chasing bait balls. 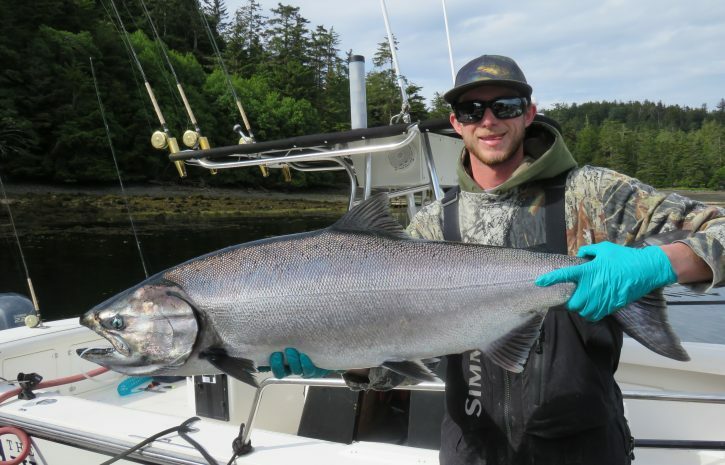 Some of these teener chinook are chalk full of huge herring. 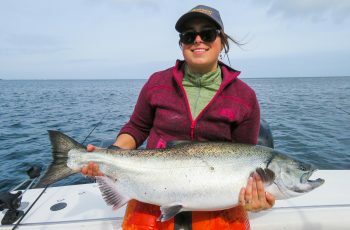 Of course the coho are caught just about anywhere, but favour the offshore areas, 30 to 50 fathom edges. So to conclude, nice to see some larger chinook in our waters. It is not hot yet but very encouraging. Signs are there that July is going to be a great month up here. The guides are primed and ready, see you soon, goodnight from the Clubhouse. Great report Mike. Thanks again for a great trip. See you next year. Say hi to Lucy. 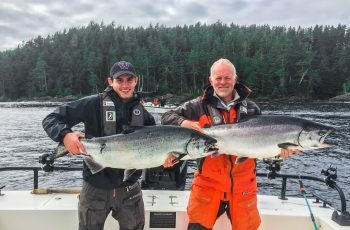 Glad to hear you enjoyed your trip – it looks like you and Liam had some great success on the water. Looking forward to welcoming you back next season.